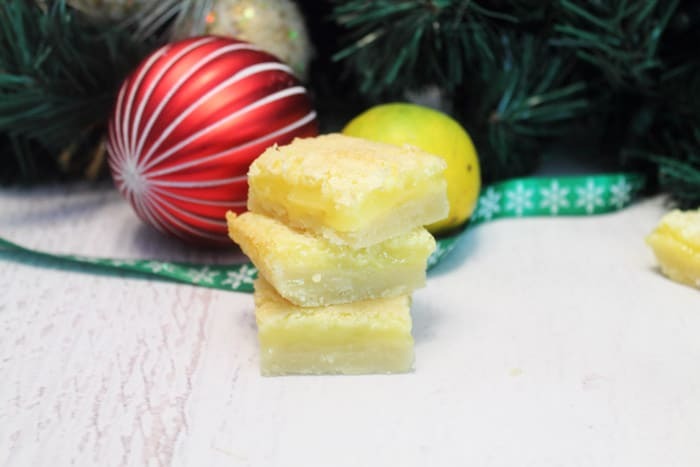 Gluten free Lemon Squares are rich, refreshingly sweet and slightly tart. A buttery shortbread crust is covered with creamy lemon filling & sprinkled with powdered sugar. It’s like a little lemon pie you can hold in your hand! It’s that time of year again when I go crazy baking every type of cookie imaginable. Do you do the same thing? I think I got it from my Mom who always baked so many yummy cookies and then made tins to give out to all her friends and family. She’s the perfect example of a true giver at Christmas time, always thoughtful, always loving and caring and was the best mom I know! So that brings me to our 5-day series all about Christmas cookies. I know it’s rather late in the season but some of us are still baking up a storm. So here are some easy, almost foolproof, Christmas cookie recipes for our delicious Christmas Cookie Marathon. 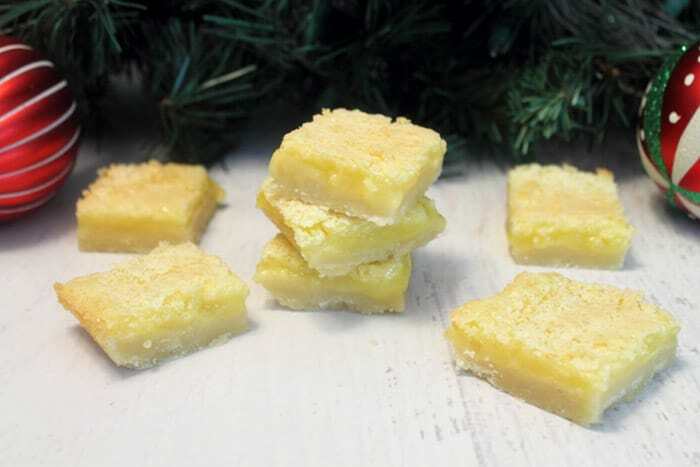 First up is a fantastic recipe for gluten free lemon squares. 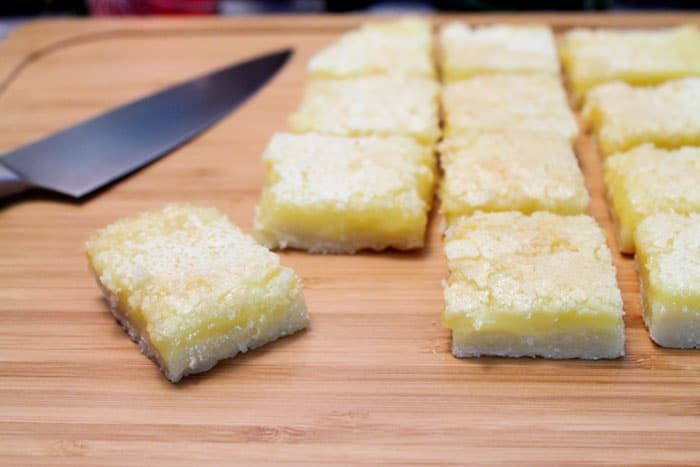 I’ve love anything lemon flavored so these lemon squares have been a favorite of mine for years. Of course, I wasn’t making them gluten-free at the time and it wasn’t until my daughter found out she was gluten-intolerant that I tried my hand at making my favorite bar cookies in a gluten-free form. Trying to keep true to the recipe, the shortbread cookie was made with a combination of rice flour and cornstarch in lieu of the regular flour. 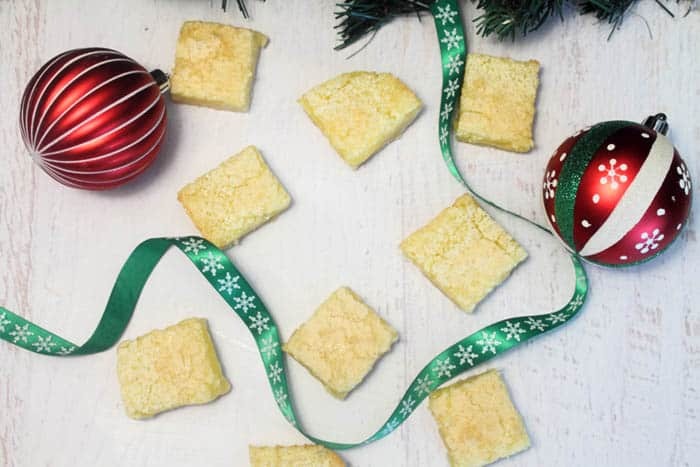 It works well at creating that buttery texture that shortbread cookies are known for. 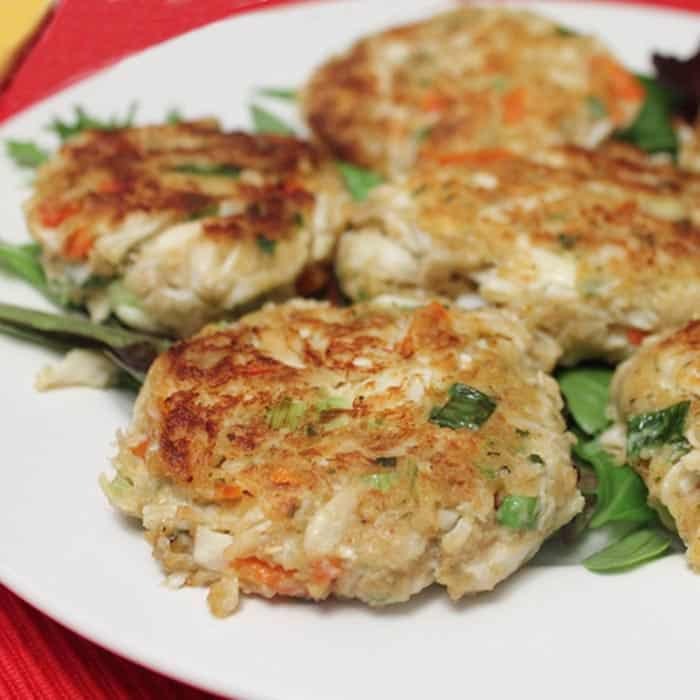 The filling used the same rice flour and cornstarch so you don’t have to feel like you are buying the rice flour for only one thing. 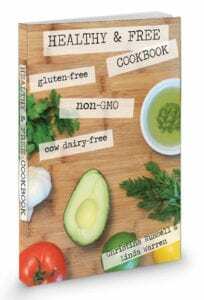 Recently there was a new product introduced to the market by Bob’s Red Mill (one of my favorite companies) called Gluten Free 1 to 1 Baking Flour. 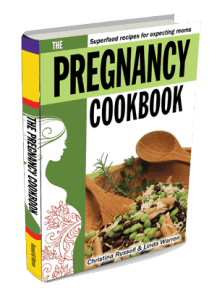 This flour can be subbed for any recipe that calls for regular flour and bake as usual. I really must try this recipe again using this new flour for a quicker easier baking experience. 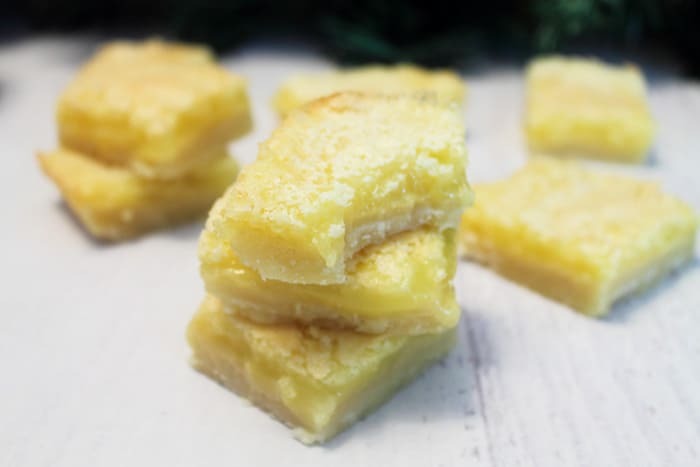 This recipe reminds me of lemon pie but, since it’s in bar form, you can hold it in your hand. Yum, a pie that you can grab on the go – woohoo! 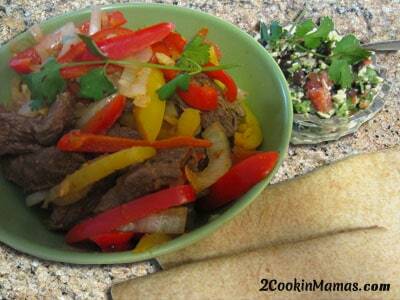 It’s tangy & sweet all at the same time with a wonderful buttery cookie to hold it all together. If you love lemon, you’ll love this cookie! I received tons of compliments on these cookies from my husband’s co-workers who, by the way, are my guinea pigs for all my baking efforts. They usually hear that what they’re eating is gluten-free and they turn up their noses before even tasting it. I fooled them with this one and it got a hands down delish rating so it must be good, right?! Enjoy! And don’t forget to check out more of our Christmas Cookie Marathon deliciousness below. 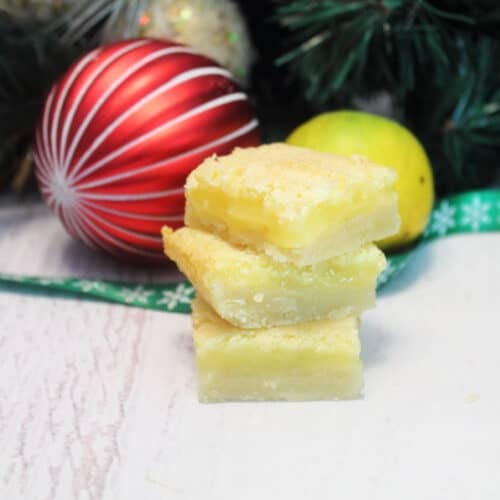 Gluten free Lemon Squares are rich, refreshingly sweet and slightly tart. They're like a little lemon pie you can hold in your hand! Preheat oven to 350 degrees. 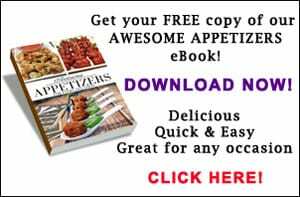 Prepare a 9×13-inch pan (check out this commercial grade pan -it really is great and will last forever) by lining with parchment paper. Extend the parchment paper up both long sides of the pan so that you can easily lift the finished bars out in one piece to cut. I also leave extra on the short sides, about half way up, just enough to hold the crust and filling. Mix crust ingredients, cutting butter into dry ingredients until it resembles small crumbs. Pat into bottom of prepared pan. Bake 20 minutes then set on wire rack to cool. Turn oven down to 325 degrees. While crust is baking, beat eggs then add all remaining ingredients for filling, except confectioner’s sugar. Pour into slightly cooled cookie crust and return pan to oven (at lower temperature) for an additional 25 minutes of baking time. Remove from oven to wire rack, dust with confectioner’s sugar and let cool. Place in refrigerator to help lemon filling gel and to make it easier to cut into bars. When ready to cut, lift out entire bar by the parchment paper to a wooden cutting board. 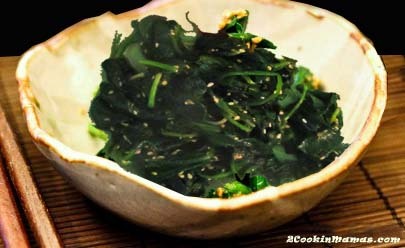 Cut into small bars, since this is very rich, and either store in covered container, with wax paper between layers, or place back in pan. 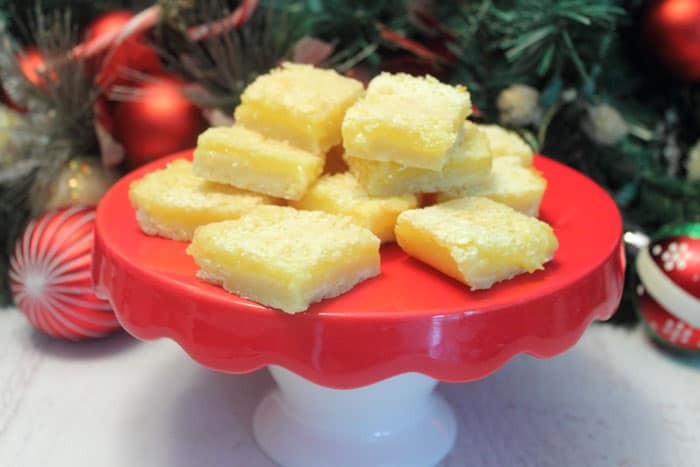 Regular Lemon Squares directions: Crust: Mix 1 cup butter, melted with 2-1/2 cups flour and ½ cup confectioner’s sugar. Pat into pan & bake as directed above. For the filling: Change out the rice flour & cornstarch for 4 Tablespoons of all-purpose flour & ¾ teaspoon baking powder. Proceed as directed.